When George and Vera Bryan opened the gates of Drayton Manor on Easter 1950, it was home to a few children’s rides and some boats on the lake. It grew steadily over the next few decades and in 1973 their son Colin took over, growing the theme park to what it is today: a home of big, thrilling rides and countless attractions for all the family. Alongside a series of high-profile rides that are acknowledged as some of the best in the business, Drayton Manor has also established Thomas Land, home of all things Thomas the Tank Engine. Set in 6,000 square metres of gorgeous parkland, Thomas Land features rides, exhibitions and interactive exhibits to immerse you in the world of Sodor. There are even hotels to make a weekend of your trip, and a camping and caravanning site. There are tonnes of seasonal events too so check out the website and you could make your visit extra special. How do I use my Drayton Manor discount code? 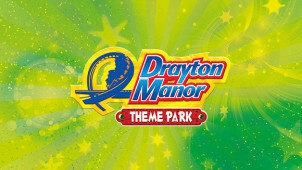 Drayton Manor’s Offers page is full of great discounts on entry and meals! How do I get to Drayton Manor? How much is parking at Drayton Manor? Parking is free of charge to all guests. As a member of the British Association of Leisure Parks, Piers and Attractions, Drayton Manor does everything it can to welcome visitors with additional needs, including providing wheelchair accessible toilets and Access Bands - issued to those unable to use the conventional queuing system. Please contact the park for more details about their accessibility. Can I get Drayton Manor gift vouchers? Absolutely, these can be found here and make for an amazing present for the fun seekers in your life. May vary during holidays. Thomas Land times may vary. Check here. Drayton Manor is one of the country’s top attractions. Promising fun, thrills and adventure - a Drayton Manor discount code guarantees fun for all the family, whilst making your day out even better value. Their infamous thrill rides such as Apocalypse and Stormforce are some of the fiercest in Europe and make for an amazing adventure. They also have a variety of attractions for those not after an adrenaline rush including the Zoo, Thomas Land and the Dino Trail! Drayton Manor’s rollercoasters have a formidable reputation. Apocalypse is Britain’s only standup tower ride and was once voted the scariest in the UK. Shockwave is one of only 2 stand-up rollercoasters in Europe, and is the only one with a zero-gravity roll, delivering speeds of 53mph and up to 4G. If you prefer water-based thrills, check out Stormforce 10: a heart-stopping three-drop ride that’s not for those who are afraid of a big splash! It’s not all big drops and water rides at Drayton Manor, the 15 acre Drayton Manor Zoo is one of the best around. With the amazing Drayton Manor vouchers at vouchercloud, you can get up close and personal with the animals and save a few quid to boot. Whether you’re into majestic birds of prey, colourful primates or the fearsome big cats, Drayton Manor Zoo is sure to make an animal lover out of anyone!